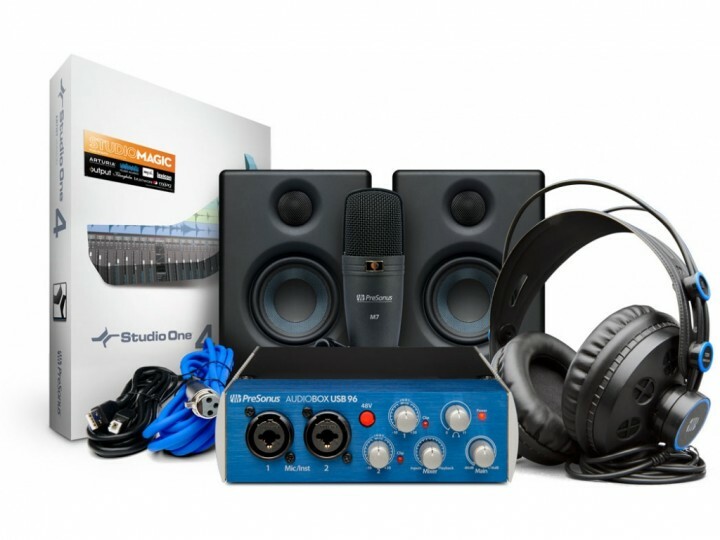 Produktinformationen "Presonus AudioBox 96 Studio Ultimate Bundle"
Produce and record like a pro with a single-purchase bundle! The core of this package is the AudioBox USB® 96 audio/MIDI interface and award-winning Studio One recording and production software. You also get PreSonus®' best-selling Eris E3.5 Active Media Reference Monitors and HD7 headphones, allowing you to monitor your work loud and proud or quietly to yourself. Lastly, the M7 dynamic microphone is a superior all-purpose condenser mic ideal for guitar and vocals-and we even included all the necessary cables and a desktop mic stand. PreSonus® Eris-series studio monitors are used worldwide by audio engineers who need to hear every detail of their recordings. Eris E3.5 employs the same technology as the larger Eris models to deliver studio-quality sound, with a smooth and accurate frequency response. They're compact enough to fit almost anywhere, but still offer robust I/O-you can connect them to nearly anything. Weiterführende Links zu "Presonus AudioBox 96 Studio Ultimate Bundle"
Kundenbewertungen für "Presonus AudioBox 96 Studio Ultimate Bundle"